My name is Melinda. I’m Mommy to one crazy, awesome, adorable, and physically draining little guy born in August 2011. I’m currently in school obtaining a Bachelor’s in Chemistry and will (hopefully) be going to Pharmaceutical school after I graduate. I started babywearing the day my son came home from the hospital with a Moby and a Bjorn. Who knew two carriers that cost me less than $30 total would open the floodgates?! I found BWI of Chicagoland when my son was 8 months old after buying a fake Ergo (Darn you Ebay!) and a really horribly sewn mei tai. Luckily, this group was there to guide me in the right direction (though my other half would say the wrong direction for our checking account). Babywearing has been a staple in my life and has allowed me to do so many things I probably never would have been able to do without it. I’ve worn my son during many of my classes (hopefully some of that Organic Chemistry and Advanced Calculus will stick with him 😉 ), I’ve been able to go to different, crowded events all over the city, go to dog parks, hikes, etc…basically all the places that strollers cannot seem to go. I became a VBE in 2013 and hit the ground running! When I’m not babywearing, I’m either sleeping, drinking coffee, attempting/failing at being domestic, attempting to get the Man to do something around the house, or out and about trying to keep this kiddo busy! Lisa has been using various carriers since her daughter was about a month old. Her first carrier was a Bjorn. She prefers her SSCs now that her daughter is a toddler, but also has loved ring slings and wraps. Before being a mommy, Lisa met her husband in music school, and was a waitress, EMT, veterinary technician, and a “hard goods” salesperson (anything that isn’t a plant) at a garden center. She still works at the garden center, but also cat sits and weaves in her “spare” time. Babywearing has made life so much better for her in so many ways, so she was inspired to help other caretakers find a way to carry their babies that works best for them (and so decided to become a VBE). Thank you to all of the wonderful people I have met along this journey who have helped me, and the wonderful friends I have made! I am a former special education teacher turned stay at home mom to my daughter (23 months). We are currently expecting our second baby at the end of the month (October 2014). 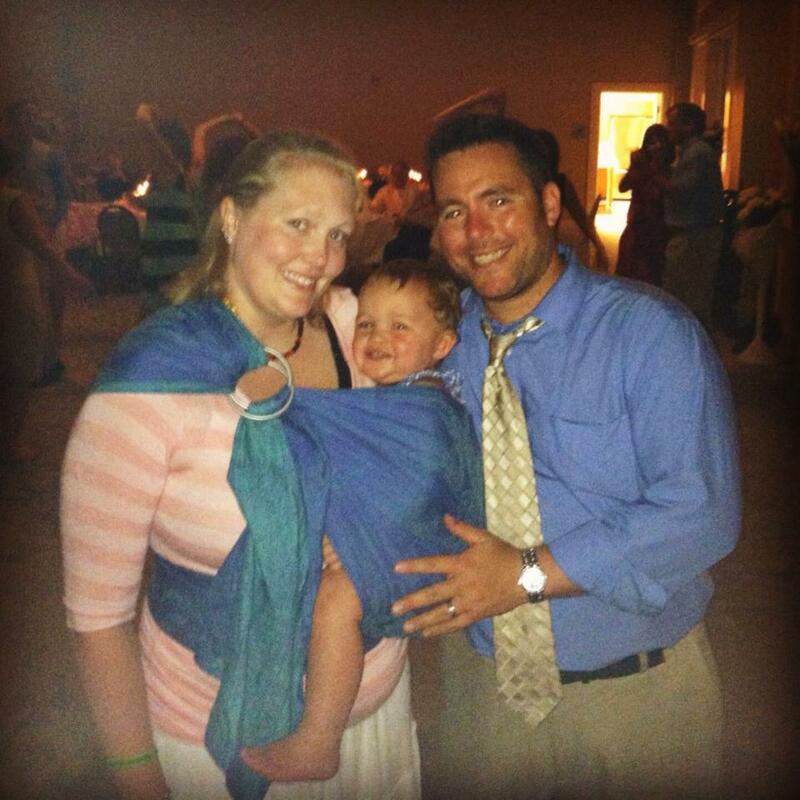 I began babywearing when our daughter was eight months old, it has been an amazing experience. Babywearing has allowed me to keep my daughter close and has helped comfort her through tough times (teething, illness). When I have free time I enjoy an array of crafts, sewing, knitting, crocheting. I also compete with a master’s swim team. I’m Suzie Campbell and live in Evanston with my daughter and husband. I started babywearing when my daughter was about 2 weeks old in a Moby and soon after an Ergo. I became a Chapter Support Volunteer fall of 2015 and I have recently become a VBE in May of 2016. Babywearing was essential for me living in a 3rd floor apartment. Wearing my baby while carrying groceries up the stairs makes me feel like super woman. I am a soft structure carrier girl, but love to try all the different types carriers. I look forward to teaching lots of caregivers about the joys of babywearing. I am Stephanie Hopkins and I live in Bartlett with my husband and son (and Baby #2 due in February). I started babywearing when my son was about 5 days old and am still wearing him at 2 years old! I knew I wanted to babywear when I was pregnant so I spent lots of time learning about different carrier types and had several options to try when he was born! I love pretty much all carrier types and can make a case for most of them depending on the child, parent, and situation! I started attending BWI meetings when my son was about 3 months old. I was a meeting groupie for a long time and then became a volunteer when he turned 1. I became a VBE in October of 2015. Babywearing saved my sanity when my little newborn curmudgeon was only happy when being held. Now it saves my sanity when my wiggly and busy toddler needs a break (or I need a break!) from running around everywhere. In my free time I am an early childhood special education teacher for the local school district. I also am an adjunct professor for Judson University in the education department and CPST (car seat tech). As a mom who works outside the home, babywearing has also helped me reconnect and feel close with my son after a long day or week apart. I love working with families and caregivers with all my jobs and activities and BWI is another fabulous way to connect with families, support caregivers, and ogle at adorable kiddos! Hey there! My name is Molly Scott and I live in the northern suburbs with my husband and our 2 boys. Our first child was born in April of 2009 and our second child was born in September of 2014. I never wore my first son, as I didn’t know much of anything in regards to babywearing and was also working full time. I am a stay at home mom now and I’m so grateful to have discovered the benefits of babywearing a few months before my youngest was born. We have been wearing since he was a few weeks old and have tried a variety of carriers. We started with a Moby and quickly went to a Tekhni woven wrap for my little chunk. We have used ring slings and a few different wraps and a couple brands of SSCs. I decided babywearing was the right choice for us since I needed to multitask with 2 boys- grocery shopping, waiting at the school bus stop, other errands, in everyday life, the convenience and freedom it gave me, along with my sanity! Something I didn’t know when I first started wrapping was babywearing is that it is also beneficial to PPD. My doctors told me I was at high risk for Postpartum Depression/ Mood Disorder and being able to wear my son helped alleviate that a bit. I joined BWI of Chicagoland as a Chapter Support Volunteer in September of 2015. As of August 2016, I joined the Board of Directors in our Chapter as the Secretary. You can find me at the Mundelein 101 Meetings and Mundelein Playdates. If you have any questions about our free meetings, paid membership and learning/lending library, please don’t hesitant to reach out! Come say hello and Happy Babywearing! I am a stay at home mom to three little boys. The first one was born in November of 2010, the second one was born in November of 2012 and the third was born in June of 2015. I am also a college student that will hopefully have a degree sometime before my children are pursuing their own college degrees. In my free time (hah!) I love to knit and to dance (not at the same time). I am a cancer survivor, which is related to why you will usually see me wearing a hat. I started babywearing with my first child when he was just two months old. He was a high needs baby and my arms and back just couldn’t take holding him all the time. I still wear him regularly because it is an instant way to calm him if he’s upset for any reason. He is on the autism spectrum and babywearing is one of the best tools in our toolbox when it comes to life with that. When my second child was born, I discovered just how necessary wearing really is. I spend most of my days wearing one child while chasing after the other. I also credit babywearing with helping me through my postpartum depression after my first child was born. Being able to have my children close, yet still have my hands free to take care of my own basic needs, was (still is) vital to my health, both mental and physical. I would not be the parent I am today without babywearing. Congratulations on the new baby, Madrid! We have many classes all around Chicagoland. Our classes are always free to attend. You can find all the upcoming classes on our calendar here: https://bwichicagoland.wordpress.com/calendar/ Hope to see you at one soon! Congrats! We have several free meetings around the city and suburbs. The next one is this Sunday the 20th at 10am at Swedish Covenant Hospital on the northwest side in the city. Check out the calendar of events on the blog for other upcoming meetings! Congrats again! I just realized that I missed the meeting in grayslake. What should I do?